For that BIG assignment or travel where recharging is unavailable, TURBO 3 the right tool for the job. By using the latest in battery technology, Quantum has made the TURBO 3 remarkably small and light for the power you can tap. Quantum’s TURBO 3 is the ultimate portable flash power pack, providing 1050 full power flashes for a typical shoe mount flash. When shooting in TTL, many thousands of flashes are possible before recharging. In spite of this power, Turbo 3 mounts comfortably on a belt or worn over a shoulder. Clamp it to a light stand (optional QBC accessory) to power remote flashes. 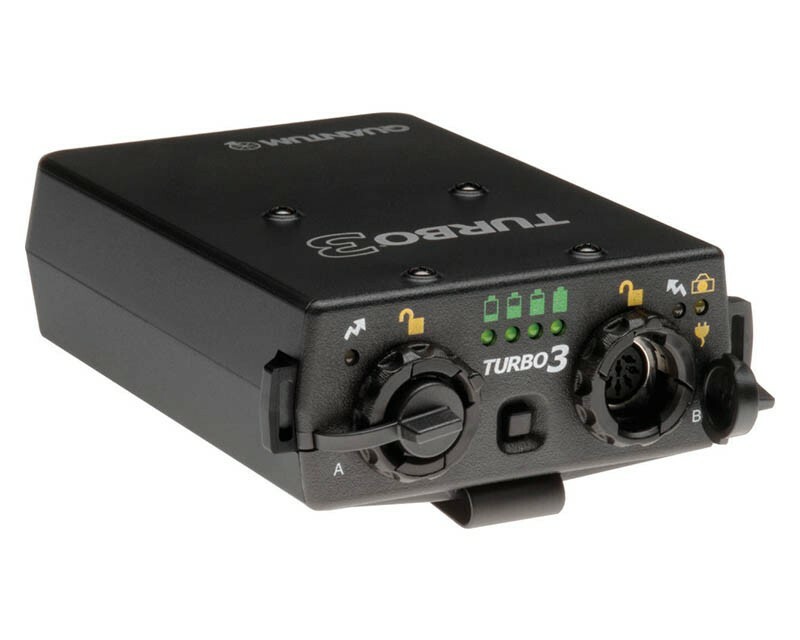 In the studio or on location, Turbo T3 becomes your reliable power pack. Turbo 3's "fuel gauge" assures you won't miss an important shot. New "locking" flash cables keep your connection secure. With two sockets you can simultaneously power your flash and digital camera, providing greatly increased operating time for your HD SLR.